I need a form that handles both one time set up fees and subcriptions choices. Can jotform handle this? monthly subscription fees. I have an auth.net account. It is possible to setup subscriptions on on your jotform. Unfortunately you are not able to setup several one time fees unless you include it in a manner that i have included them in the jotform here: http://form.jotformpro.com/form/42827285588975. You can see here how to clone the jotform to your own account: How to Clone an Existing Form from a URL. It will place them a bit more inside than the other fields. If you add this CSS next to the one above you get an extra explanation of the price. You can see here how to Inject Custom CSS Codes . Do let us know if this is something that you like and if you have any further questions. I have spent hours on this. Now, I simply want the form to calculate manually what I choose. I will hand enter the information into auth.net. I am now trying to figure out how to have different options (one time fees) calculate and show up as a total at the bottom. I then want to insert a credit card info collection field without having to associate it with a payment gateway. I figured out how to get totals. The problem was simple: To add values into the calculations box in a case where there are multiple value options, you simple enter a value, for example 10, then on the next line below add another value, and so on. I was stuck but figured it out. I did this early on, yet my values were not adding. The 2nd big problem is that I did not know that you have to view the form outside of edit mode for the calculations to work. I kept trying in edit mode and they would not add up. Yes, our form calculation is used for that, but unfortunately it can not be used in the manner that you have made it. I then want to insert a credit card info collection field without having to associate it with a payment gateway. The only way to include this properly and have the payments set for each month subscription is to use the subscription in the manner as I set it up or to use iframe embed and embed 2 different jotforms. One with the mandatory 1 time fee only and the other with the optional fee included as well and show/hide them as appropriate. You can see here how to clone them to your account. If you want I can come up with jotforms that would capture all of the options you wanted as well not just one option, but I wanted to just show you how it should be done in case you are interested in this approach. ***I need to capture one time payments on different areas of the form. I plan on manually entering the recurring payments into authorize.net. They won't get charged at time of checkout (only mobile website but then I will set it up in authorize,net afterwards for revolving). Most recurring payments I will enter manually into authorize.net later, because they will not be due at time of checkout, say 2 weeks after the sale depending on when they get the equipment and it is set up and running. 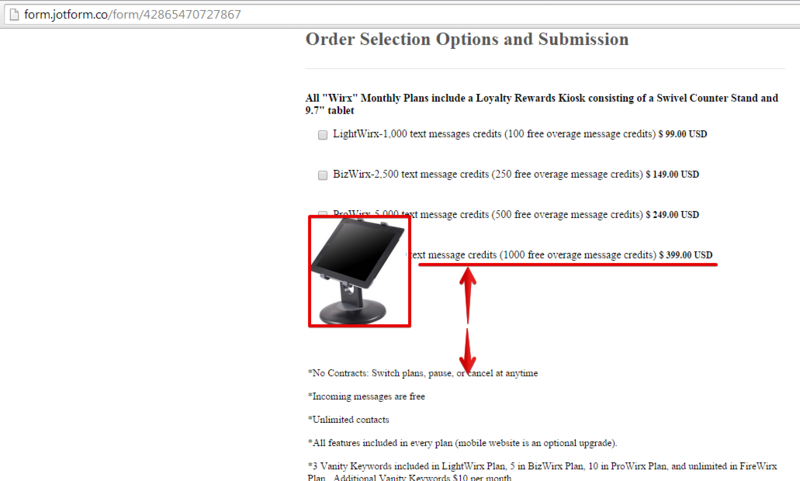 If you read the print underneath the "Wirx" packages, it says that payment will not be charged until their customer opts-in to the program or the kiosk is set up--max of 2 weeks from time of sign up but could be sooner if the kiosk is up and running and one of their customers "opts-in" and used the kiosk before 2 weeks from shipping. The extra kiosk is the same type of situation. If you read under any payment choice that will be revolving (recurring) there is a statement of explanation of when that revolving payment will begin. There are not secrets. The one time payments are added to the total at the bottom along with the 1st revolving payment of the mobile website (only if they order this). 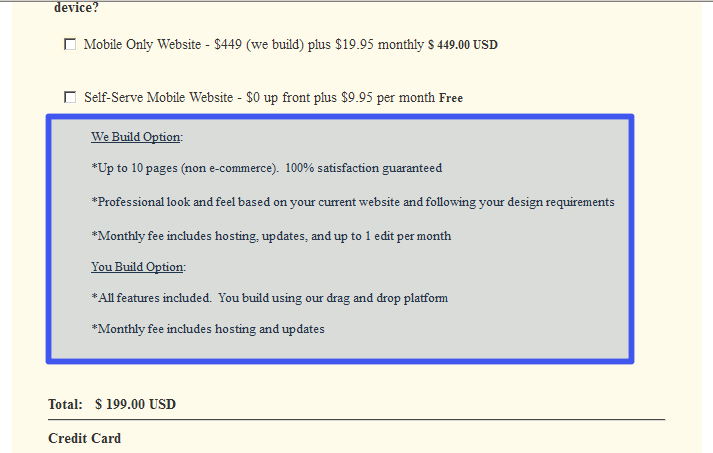 I will then add the revolving payment for the monthly website fee manually to authorize.net for the next monthly payment. I will log into their system and set it up separately. I don't have a clue how you did what you did . . . I think there is misunderstand. I am tired and need to sleep. Tomorrow I will review your notes and references . . . my guess is another 14 hour day without a form completed. I have been working on this one form for 10 days. I don't understand css or iframe. I have worked on this for 14 hours on this today. I literally have not left the house because I need to get this done and behind me. I understand, it can be seen that time and effort have been added to jotform. You must have them removed. 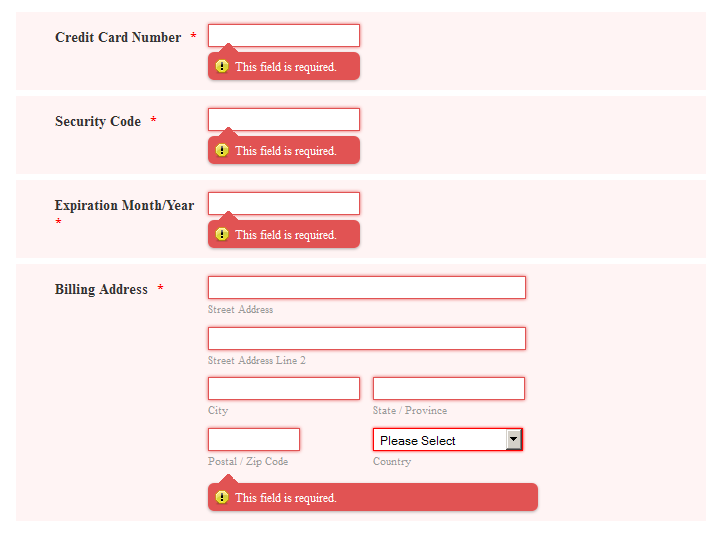 ***I need to capture one time payments on different areas of the form. I plan on manually entering the recurring payments into authorize.net. They won't get charged at time of checkout (only mobile website but then I will set it up in authorize,net afterwards for revolving). Most recurring payments I will enter manually into authorize.net later, because they will not be due at time of checkout, say 2 weeks after the sale depending on when they get the equipment and it is set up and running. OK, in that case you do not need to use subscriptions. You can use products instead and add different options to them to select (fees). Let me try to create something for you to take a look if that is what you wanted to achieve. I will leave the old jotforms as well and will be creating new ones with this new info. I presume that this is what you want to achieve. Now, there is a bit of trick here involved, it will not allow you to edit things on your jotform as you would usually as things look messed up. If you really want to change something it would require some additional changes in the CSS as well since everything is depending on the current position. Thanks so much for assisting me with this. --removed one line of text under "Are you happy">"You build option"
*I wanted to removed the text under "Additional Loyalty Kiosk" but could not. Can you remove this line of text? *Change the text under "Instead of the Stand that come with . . . . " Change to: *We offer a full refund within 30 days of receipt for any stands found to be defective. Returns for any other reason within 30 days of receipt will be refunded in full minus cost of shipping. Are you able to make recurring charges for the following? "Wirx monthly plans," "Additional Kiosk," "Monthly Campaign Management," "Mobile website only and self-serve Website" If it is easy, then this would be a perfect solution. Or, if you are able to make some recurring and others not, it would save me from having to go into authorize.net and manually enter them. This is not super important; I like the form you built. If it can be done without much effort or degrade the "clean" look of the from, then great. In this case I would need to have access to adjust revolving charges if needed. Who is qualified to make the changes to this form in the future? A CSS expert? I appreciate your support, but understand you are super busy, and helping me "extra" in this particular case. If I decide to offer a discount or "free" one time charge in the future, can I go in and put a promo code box that the customer will enter the promo code and receive the discount or "0" charge? Would it be easy to turn the promo code box on and off? If the form is set up for recurring charges and I need to pause recurring billing for a customer as needed in the future, would I log into authorize.net and do that? Would I also need to "pause" it in jotform also? I cannot click on the credit card field which is how I was able to put in my api key and password for auth.net previously. If I click on payment tools and choose auth.net, will it automatically put another credit card information field into the form? How do I add auth.net? Your message has reached my colleague. He will get back to you when he is available online. Before any removals are made, I would like to check with you and confirm if I understood you correctly, so please tell me if everything is correct or if something is not. *We offer a full refund within 30 days of receipt for any stands found to be defective. Returns for any other reason within 30 days of receipt will be refunded in full minus cost of shipping. Are you happy with your website, yet want to enhance your mobile presence and make it easier for customers to navigate your website when viewing from a mobile device? Are you happy with your website, don't want to change it, yet want to enhance your mobile presence making it easier for customers to navigate your website when viewing from a mobile device? The recurring option however would only be possible in the manner that I have built at the top, which would not give you the properties that you wanted from your jotform. Feel free to contact us if you need any help and we will be happy to help. If you go into the "inject CSS styles" field for your jotform and cut the styles (make sure to paste them to notepad or any other such plain text editor - must not be rich text editor like Word and similar) your jotform will restore itself into the original state. So you can go into the Payment Processor widget and change it in any manner you wish. Now if you take a look at that CSS that you had just cloned you will also see that some text was entered from there - just look for content: property. This one might give you trouble, but anyone with CSS coding skills can help you with that. Yes, you can add anything before the payment processing widget and right before signature widget. If you place anything in between then the CSS would need to be changed as well, but as mentioned, if you place it above or under, it should all work properly, allowing you to add any fields you like, such as a box with promo code. The discounts are added in the payment processing wizard pages. To access them, just right click on any part of the widget and select Run Wizard option. This will give you the access to your Authorize.net wizard to set the keys and available discounts/what they cover - anyone here can help you with that. I do want to repeat that you will not be able to setup recurring payments with the last setup I had made. Only with the one near the top using iframe embed widget. You might need to remove CSS, but you should be able to see the option to start the wizard by right clicking on the Authorize.net payment wizard from within the JotForm Builder. Once you activate it you can make the required changes and add your API key. The jotform you have cloned (the last one I posted) is for Authorize.net payments. You would only need to change the details as mentioned above so that it is connected and so that you can start collecting payments. My apologies for the confusion. I made the changes changes I requested of you on the form below. Please use this as a reference to answer your questions. OK, I will take a look at this and let you know once I make the updates. You can use this link to reference the changes I requested. I noticed one error I made in my last request to you so I updated it to this form this morning. Ben, are you able to put the authorize.net verified merchant seal on the form? You are welcome. I have worked on your jotform for a bit and I believe that you will like the improvements. This applies to the text boxes that are right under it and moved upwards on preview. Now if you do some changes it might require (and might not) require some changes in the CSS as well. What you should not do is remove the "EMPTY #" products in the wizard. I have used them to add text that would otherwise not be possible to add over CSS alone (and to look properly). Basically everything from start and before Signature Widget should not be moved or have something added there or it might break the code (probably will). You can see the "content" property followed by text that is shown on your jotform. If you want to make some changes, finding the CSS entry for it and changing it will change it on the jotform as well. If you are not sure how to do this, just let us know and we will help you with that. This can not be added to jotform because of the script part. We could remove the script and leave an image instead, but that is an alarm raiser for many people that know that there should be a script on there. So in the end, if you want to add some fields after the signature, that will be OK. If you add anything at the top, it will alter some things, but if you let us know we can help you set it up again. Do let me know how this looks to you. Thanks for your help! The form looks great! --When you say that our conversation are moved to "threads" I have no clue how to go find a thread. I just go back to my emails and try to find our conversations. I tried to log into jotform and find a place to enter a thread # and pull it up, but could not find anywhere to do this. I did a search "how to find threads" and found nothing. I end up digging through multiple emails or doing an email search to try and find out email content and subject; it is getting out of control. Right now I am looking at several different emails trying to respond. Are the threads a benefit on your end? Do I just search through my emails like I have been doing to try and find conversation threads, or is there somewhere else I should be going? --I wanted to delete this: *Monthly billing starts upon receipt of first customer opt-in, or two weeks from the date the kiosk is shipped (whichever occurs sooner). However, it is in the CSS therefore I was reluctant to delete it. Can you delete this? --For the free "You build" website option, can we make it so they can put a check mark into that box? Now, you cannot put a check mark there. If I am a new customer signing up and want this, by not being able to check the box, I may think I will not get the "You build" option for free. Can you fix this so someone is able to check the box even though it is free? I don't know how. --You said: "Yes, you can add anything before the payment processing widget and right before signature widget." O.K., I understand. So does this mean I find wherever I want to make an announcement about a discount and then add a text box and then I will be able to go to the wizard? --You said: "The discounts are added in the payment processing wizard pages. To access them, just right click on any part of the widget and select Run Wizard option. This will give you the access to your Authorize.net wizard to set the keys and available discounts/what they cover - anyone here can help you with that." The only place right now i see to be able to manipulate anything that has to do with payments is in the CSS you created because there is a "Wizard" icon to access. So when you say just access any part of the widget, I don't know what this means or how to get there. --To confirm, the form is not set up for recurring payments correct? I am reluctant to make the top part recurring because I don't know how that will integrate with any other manual recurring payments I set up when I log into auth.net. In other words. when I log onto auth.net, I don't know where I will see it the recurring payment captures in jotform. Also, I don't know if I will have the flexibility of pausing those payments or switching customers to a higher or lower subscription plan. I know that if I enter the monthly plan in manually from the beginning into auth.net that I will be able to make future adjustments: pause, change monthly subscriptions, cancel. Lastly, I don't have a clue how I would make the to monthly plan section recurring payments if I wanted to. When you say: "Only with the one near the top using iframe embed widget." I don't know what this means. Your message has reached my colleague @Ben. He is not available currently but he will get back to you as soon as he is available online. --When you say that our conversation are moved to "threads" I have no clue how to go find a thread. I just go back to my emails and try to find our conversations. I tried to log into jotform and find a place to enter a thread # and pull it up, but could not find anywhere to do this. I did a search "how to find threads" and found nothing. I end up digging through multiple emails or doing an email search to try and find out email content and subject; it is getting out of control. Right now I am looking at several different emails trying to respond. Yes, I will add a note about this to our developers to see if there is a simpler way of doing this, but currently this link is what can help you to follow up on your threads. Are the threads a benefit on your end? Do I just search through my emails like I have been doing to try and find conversation threads, or is there somewhere else I should be going? It is a benefit to all since it allows us to quickly see what the issue is and answer your questions more promptly. If you would like to continue responding through emails then I would only ask you to remove all previous content from the emails if you do not mind. Do you mean left of this text? OK, to confirm this, you can only add after the signature widget, not before without changing CSS code. The CSS is based on the current position so everything added or moved in front of it will break the style to some extent, depending what, where and how big it is. 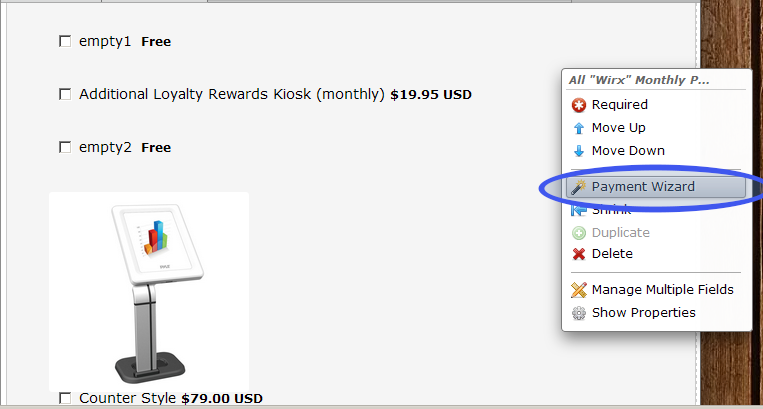 I have cleaned up the builder so you can now access the Wizard at the top or any part of the payment processing widget. I am sorry I do not quite understand this. What I can tell you is that this form is set to sell products only, not as the subscriptions. You can not mix it up to have both options used in the exactly same time (filling out few things in one iframe and few things in another).
" --For the free "You build" website option, can we make it so they can put a check mark into that box? Now, you cannot put a check mark there. If I am a new customer signing up and want this, by not being able to check the box, I may think I will not get the "You build" option for free. Can you fix this so someone is able to check the box even though it is free? I don't know how. ----Yes, I can now go into the payment wizard and make adjustements--great! Then, to get rid of the box, I will put back to /*visibility: hidden;*/ I am still a little confused here, but will experiment and see what happens. I need to review and see how this ties in with the existing payments and where to apply a discount. ----When I go into the payment wizard, I see my auth.net api information. I am assuming this means I am ready-to-go when I take it off of test mode.? ----One time payment is fine . . . this will be a big help. I will log into auth.net after a sale and put in recurring payments as needed. ----Before, I could not put a "mark" in the checkbox for the "Self-Serve Website Option". Now, I can--you fixed it. Yes, you should enter it if not already and then test the connection. You can see more here: How to Test Authorize.net Payment Tool on Sandbox Mode? I took out my auth.net api info, plugged in the sandox info to test. I previewed the form to test, starting entering info, then when I got to the bottom of the form I noticed that the area where there is an option to buy a website is not showing correctly. I did not change the css or add any fields to the form so I am not sure why it looks like this. I tried to check one of the boxes but it would not allow me to. Is this the issue you are pointing to? I am not sure how and where you want this image to be presented. Do you want it to displayed after the last product as I have displayed in the screenshot above. 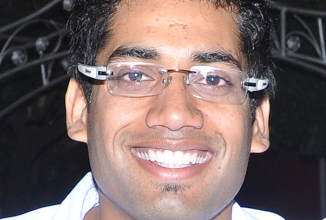 Do get back to us if you want the image to be placed in some other location and we will surely help you. In addition to what you pointed out, if you look towards the lower part of the page just above the signature line, you will see some issues there as well. The form looked fine and then I put it into auth.net sandbox mode. When I did this, I thought I saw the form 'reset' or 'shift' in the background. Could this have something to do with it. When I am looking at the form in edit mode, there is a box notifying me that i am in sandbox mode and if I would like to disable. I am reluctant to make css changes; I have never done it before. However, thank you for giving me the instructions on how to do it in reference to the error at the top of the form. I thought I reached the goal line .. . the form looked fine, I was simply going to test in sandbox and then it was done. Ben is stepped in to help me with the technical css stuff. Maybe he can take a look and clean it up again? Sure. I have sent a message to Ben and he will get back to you once he is back online. You should not need to change anything in CSS during the Sandbox period. The difference in CSS is there only because when you add the Payment Processing widget into the Sandbox mode, it creates the small notification about this. This in turn will move things around a bit for maybe 100-200 px towards the bottom. If it does not allow you to properly test things out do let us know and we can help you with a CSS code that would allow you to sandbox the widget properly as well. Upon cloning your form, for testing purposes, I see that you have some missing fields and conflict on your saved conditions? Are you referring to the problems seen on the live form where there are overlapping of text and fields? We will try to look at this again and also inform our colleague Ben to assist on the continuity of this thread. Also, if you are still having other problems related to this, feel free to post it here, a screenshot would also be helpful. Question: I filled out the form as if I was a customer making a purchase. The form came back to my email thanking me for the purchase, yet in the Merchant section, it had Dennis Carr (my name) instead of Mobilewirx--the name of my company and the name I want in there. I did go to my account profile and searched for where it says 'Dennis Carr' so I could replace with "mobilewirx" However, after searching, I could not find this. What I ended up doing was putting 'mobilewirx' in the 'company name' space. Will this fix the problem? Also, I noticed that it says that the submission was an 'insecure' submission. When I place this form on a secure 'http' website will i still see the transmission as 'insecure'? Is this a security vulnerability? I thought I was to the goal line and then noticed in this form text and images had shifted in several places and is not reading correctly. Ben helped with custom css to get it finished with the options i needed. The only adjustment I made that may have screwed it up was that I made the date a requirement under the signature line and made the date default to the current date. Oh, and I did put it in sand box mode. This screwed up the text and images, yet I thought it would repair itself once I took it out of sandbox mode and entered my original auth.net api info, which I have done. OK, so if my memory serves me right, the text under the monitor photo was not like it is now. I presume that there was some change to this and the issue is now presenting itself in this way. Now I see that you have removed the coupon code, which has definitely caused some of the movement to appear. There is however a very quick fix for this. Since you have already added the payment details and tested it all out, this time I have added this code to your jotform so please check it out as it should be working properly now. Please take a look and let us know if there are any issues with it and we will help you with them. I did not do anything with the css--including coupon. I was hoping it would be there so i could use it in the future. As far as the wording under the monitor, there was a line that was changed/reworded--I thought by you, because I did not want to mess anything up. The only thing I did was sandbox testing (that's when I noticed the form was tweaked). And, as mentioned, made the date a requirement along with plugging in the current date automatically. Thanks for the update. I haven't followed the entire conversation, however based upon your last comment it sounds like you have all the information you need at this time. Feel free to contact us if you do have questions that come up regarding this or other issues.